Top ant cadaver covered in pathogen Metarhizium brunneum. Mixing chemicals to enhance the antimicrobial properties of a substance is something we do as humans. This phenomenon is kind of a rarity in nature though. The vast majority of chemical producing species are dependent on evolutionary processes to enhance the function of their exudates. This new 2017 study conducted by Timothée Brütsch and his team found that wood ants mix substances to increase the pathogen and parasite resistance of their homes. Some insects enhance their resistance internally, through the uptake of plant secondary compounds which makes them unpalatable or poisonous to other predators. It has been proposed for quite some time that a single species may exogenously mix a chemical cocktail using compounds produced in other species, but finding this in nature has been difficult. For about a decade now, individuals of worker wood ants (Formica paralugubris) have been observed taking globules of resin from coniferous trees back into their nests. Also, like their genus name suggests, Formica paralugubris produce formic acid. Additionally, these ants synthesize succinic acid which is produced in much less quantity. These observations along with this ant’s biology seemed like a great lead to follow in hopes of discovering a species that mixes up potent chemical cocktails exogenously. 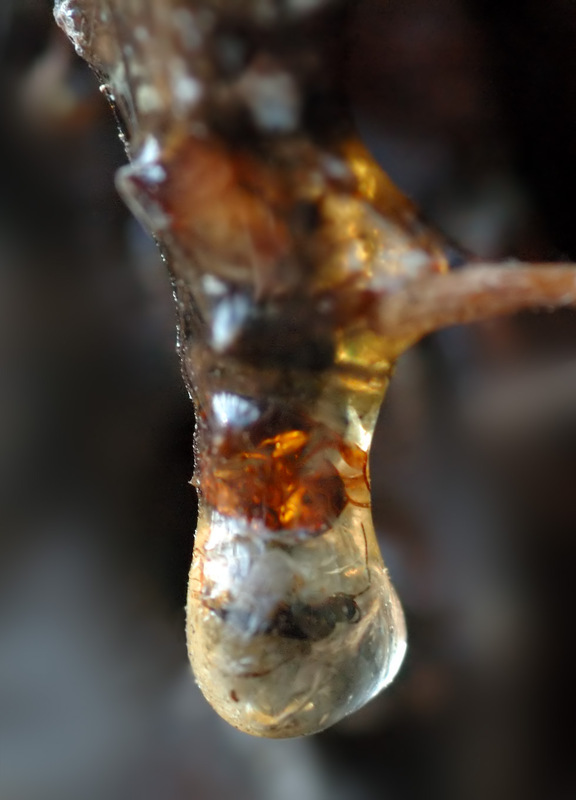 Insect trapped in bioactive resin. Already, without the addition of any other compounds, the acids the ants produce act as an impressive antifungal and antibacterial agent. Even humans use formic acid to clean surfaces and preserve grains and cereals. To find out if Formica paralugubris incorporates chemicals from other species to increase its own fitness, these researchers first had to find out how the tree resin was being utilized within the ant’s nests. To do this, researchers collected resin, and inert twigs and stones and placed them either with or without worker ants. They then tested how the objects in contact and without contact of the worker ants interacted with the ant fungal pathogen Metarhizium brunneum. The resin in contact with worker ants was significantly more inhibitory to M. brunneum than resin globules out of reach from the ants. Moreover, the small stones and twigs left with the workers did not inhibit the fungus, even though the acids where isolated from their surfaces. This shows that workers are selectively allocating resin to their nests but spray their compounds throughout the nest. The pathogenic nest inhabiting fungus is only controlled by the resin treated with ant exudates and to a lesser degree, resin alone. When resin and inert control substances (small glass pieces) where treated a manmade ant acid solution, the treated resin reduced pathogen growth while the treated control showed little influence. This indicates that the ant compounds alone cannot moderate the growth of the specialist fungus. Fungal inhibition as a function of nest object and treatment. Timothée Brütsch et al. 2017. Given long enough, new chemical compounds would evolve in the ants that would control M. brunneum. However, these wood ants skipped the millions of years required for the evolution of more volatile antifungal compounds by using a substance from tree species that had an independent evolutionary trajectory. Over millennia, species living from the forest floor have developed unique chemical compounds that aid their growth and reproduction. Usually, the species involved in a specialized pathogenic relationship, like the one seen here between the wood ant and M. brunneum, a kind of chemical “arms race,” can ensue. Through time, the infectivity of the pathogen oscillates with the evolution of more active antimicrobial compounds from the host, and the more effective compounds produced within itself. By incorporating properties evolving outside of a specialized “arms race,” species like Formica paralugubris can be liberated by the limiting shackles of its own evolutionary trajectory. Tree resins evolved to reduce fungal, bacterial and insect pathogens and parasites. This new research shows that these properties are not only harnessed by wood ants, but actively enhanced through the application of two acids the ants produce. This research highlights a type of “defensive mixology,” ants utilize that keeps their homes pathogen free. Eusocial insects continuously surprise me in their ability to manipulate their environment to enhance their fitness. By using compounds synthesized in other species, wood ants skipped the millions of years required to successfully combat pathogenic fungi.